The Coulee Region of Southwestern Wisconsin lies in the so-called "Driftless Area", untouched by the glaciers. Limestone bluffs overlook narrow valleys. Mixed hardwoods shade the creeks in the valley bottoms, cooling the water, and slowing runoff. 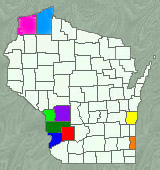 The Wisconsin D.N.R. and local sports clubs have done habitat improvement work on hundreds of miles of streams, stabilizing banks and creating permanent cover. Fish populations have increased to levels rivalling the famous western streams. Public access is assured on these improved waters, which are an easy two hour drive from Madison, via U.S.14. Snow melt and rain percolate through hundred's of feet of soil, emerging as cold, clear springs, rich in dissolved Calcium Carbonate. These streams are true limestone spring creeks, just like those found in England and Pennsylvania. The hard water promotes abundant weed growth, and supports incredible populations of aquatic insects and crustaceans: food and cover for the wild browns and brookies. "Bob's knowledge of the streams and fish is unsurpassed. His ability to recognize and correct presentation errors is uncanny. I spent a very enjoyable two days, and learned more about trout than I had in the previous six years of going it alone." "...a very valuable experience. Do yourself a favor, and book a trip with Silver Doctor Fly Fishing". Rods rated for 2wt.-6wt. lines are recommended. Accurate casting is necessary, cover can be thick, so shorter rods work well, however there are many open areas where the beginner can fish without fear of tangles. See the HATCH CHART for patterns. The 2018 Early Inland Trout Season will open at 5:00am on January 6 & run until midnight on the Friday before the 1st Saturday in May. Complete regulations, licenses & color-coded maps can be accessed through THIS LINK. Fishing licenses and inland trout stamps are available at Nelson AgriCenter,and at the 24 hour WalMart in Viroqua. A selection of local flies is available at the Driftless Angler, downtown Viroqua.